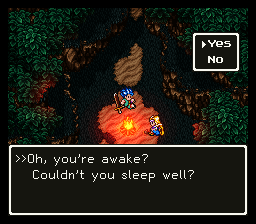 With Dragon Quest VI, Enix took most of what was good about Dragon Quest V, and expanded upon it even more. With the exception of the multi-generation aspect, everything great about Dragon Quest V has returned here intact, and in some cases, improved. The game brings several firsts. For one, the game features a total of four different worlds to explore. 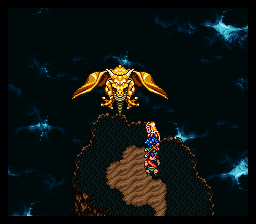 Also, it’s the first game in the series to feature monster animation, and better than average graphics. The game begins in a rather strange fashion, with you and your fellow party members being massacred by Mudo. As you can probably guess, this is not a good thing. But just when you think the game’s over before it even begins, you wake up! The whole ordeal was just a dream. But still, it leaves you with many questions. Who were those other people who were fighting with you? And more importantly… who was that big tough-guy who kicked the crap out of your dreaming arse?! So you set out on a quest to find answers to those questions, and many more. Overall, it’s an interesting and engrossing storyline. The menus are as simple and easy to use as ever - no real changes from the previous games here. Anyone with even the slightest experience with previous games in the series will have no trouble getting used to the controls. 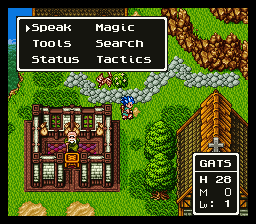 A welcome addition to the game is the return of the class system, last seen in Dragon Quest III. However, unlike Dragon Quest III, you can now freely switch your characters between classes, and work them up to new advanced-level jobs. Each class has special abilities and spells, to make each one useful in a different way. 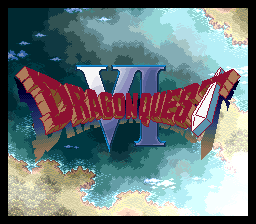 The first Dragon Quest that put effort into trying to impress visually. Not only are the overall graphics of a much higher quality than DQV’s, but the game takes a chapter out of Sega’s Phantasy Star series by implementing monster animations! Something almost every Dragon Quest game since, original or remix, has had. Overall, this is a pretty game. And as usual, composer Koichi Sugiyama never fails to impress. In fact, this may be one of his best works ever. A great emotional, and moodsetting soundtrack. You gotta hear the Orchestrated Soundtrack CD as well. Not a bad song in this game! The DeJap situation with Dragon Quest VI is a bit of a mess - At one point they had four separate released patches, each with different stuff done. This patch here, called Version A on their site, is the furthest along, probably. This has hacking work by Antiriad and Dark Force, with translation by Unafarmer and Hojo. Estimates from the website, which could be wrong, have translation completion at about 40%. 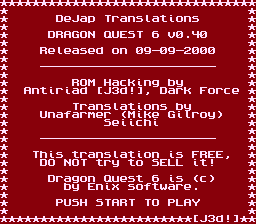 After dropping this DQVI project, they started over on a new one, this one with hacking by Antiriad, Dark Force, and NoPrgress, with translation by Avicalendriya. That was Version B, but it (probably) didn’t have as much done. It’s all moot, though, because eventually NoPrgress went ahead with his own translation, which ended up being about 90% finished (link).